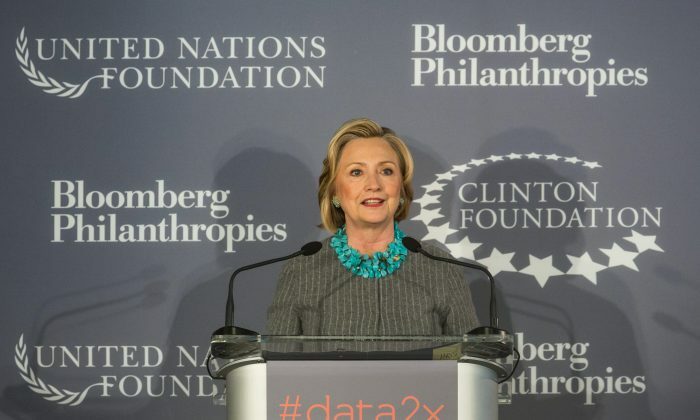 Newly released emails show that top donors of the Clinton Foundation were given expedited access to Hillary Clinton and were able to request favors while she served as secretary of state. The 725 pages of emails, which were obtained by conservative watchdog Judicial Watch as part of a freedom of information request and released on Aug. 22, are adding to concerns that Clinton improperly used her official position to favor donors—a claim her campaign has denied. The emails contain detailed exchanges that show Clinton’s top aide, Huma Abedin, fielding requests from Doug Band, a top executive of the foundation and a longtime counselor to Bill Clinton, on behalf of the foundation’s biggest donors. Unable to secure a meeting with the secretary of state through normal State Department channels, Crown Prince Salman of Bahrain requested a meeting in June 2009 through the Clinton Foundation. “Cp of Bahrain in tomorrow to Friday,” Band told Abedin in an email on June 23, 2009. “Asking to see her[.] Good friend of ours,” he added. In 2005, Salman committed to launching the Crown Prince’s International Scholarship Program, which provides funding to educate Bahraini students for leadership positions, through the Clinton Global Initiative (CGI). By 2010 the program had “significantly exceeded the $32 million original target” through donations from private companies, the organization said. The Kingdom of Bahrain is listed on the Clinton Foundation website as having contributed between $50,000 and $100,000 to exclusively fund CGI activities. Another email exchange shows how billionaire investor S. Daniel Abraham, who has donated between $5 million and $10 million to the Clinton Foundation, received expedited access to the secretary of state in May 2009. Wasserman has donated between $5 million and $10 million to the Clinton Foundation through the Wasserman Foundation, for which he serves as president and CEO. Other requests came from donors including U2’s Bono, Peabody Energy Vice President Cartan Sumner, Armstrong Realty Management President and CEO Benjamin Ringel, and Clinton’s long-time friend, Kevin O’Keefe. The new cache of emails comes after Judicial Watch released earlier this month 296 pages of State Department records. Those emails showed Band asking in an April 2009 email, under the subject line “A favor…”, for help with getting someone hired at the State Department. Another showed Band making a request on behalf of Lebanese-Nigerian billionaire Gilbert Chagoury, a top Clinton Foundation donor. Each member of the Clinton family has played a crucial role in fundraising for the foundation, which has raised over $2 billion since its establishment in 1997. Amid increasing criticism over the family’s fundraising activities while Hillary Clinton is running for president, Bill Clinton said on Aug. 18 that the foundation would stop accepting foreign and corporate elections if she were elected president. An investigation by The Associated Press on Aug. 23 showed that more than half of the people outside the government who met with the secretary of state had donated money—either personally or through companies or groups—to the Clinton Foundation. “There’s a lot of potential conflicts and a lot of potential problems,” Douglas White, an expert on nonprofits who previously directed Columbia University’s graduate fundraising management program told AP. “The point is, she can’t just walk away from these 6,000 donors,” he said. Clinton campaign manager Robby Mook dismissed the AP article, saying that the media organization had been “cherry-picking” the Democratic nominee’s schedule. According to Mook, over 1,700 other meetings Clinton had while serving as secretary of state had not been included. The AP article, however, stated that it did not include meetings with U.S. federal employees or foreign government representatives because such meetings would have been part of her diplomatic duties. “The Clintons have spent decades as insiders lining their own pockets and taking care of donors instead of the American people,” said the Republican nominee in a statement on Aug. 22. Clinton campaign spokesman Brian Fallon defended the charity on social media. “The Clinton Foundation is a charity that helps people around the world. It’s already announced major steps it’ll take if Clinton wins,” Fallon said in a tweet. The organization describes itself as an on-the-ground foundation that helps with international programs on various matters such as economic development, climate change, health and wellness, and gender equality. It received an A grade from CharityWatch.org in April this year.